Hey, hey and happy Monday! Did you have a nice weekend? We’ve been soaking up blue skies and 70s (finally!) over the past couple of days, and packed our weekend with putt putt, long walks, tank tops, hanging with friends, and half a dozen other things including spring cleaning 75% of the house. It was one of the most fun and productive weekends we’ve had in months and got me so excited for summer Farmer’s Markets, deck sailing, and open arm twirling in the sunshine – whee! Before I get too ahead of myself though, we’ve got a holiday to celebrate (if you do, of course) – Easter! Similar to Thanksgiving and Christmas, my family’s Easter menu doesn’t change too much from year to year. 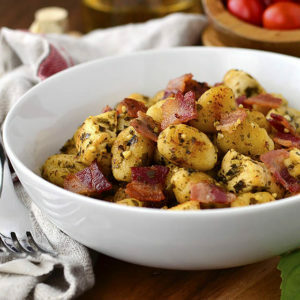 There’s always Crock Pot Breakfast Casserole in the morning, followed by a feast of Party Potatoes Deluxe, Green Beans and Bacon or Green Beans with Brown Butter Garlic-Sage Breadcrumbs (<< OMG) gluten-free rolls, and Brown Bag Baked Ham. I can’t believe it’s taken 8 years of blogging to share this IGE-family holiday staple with you! Brown Bag Baked Ham is as simple as the name implies – throw a ham in a brown paper bag then bake it. HA! 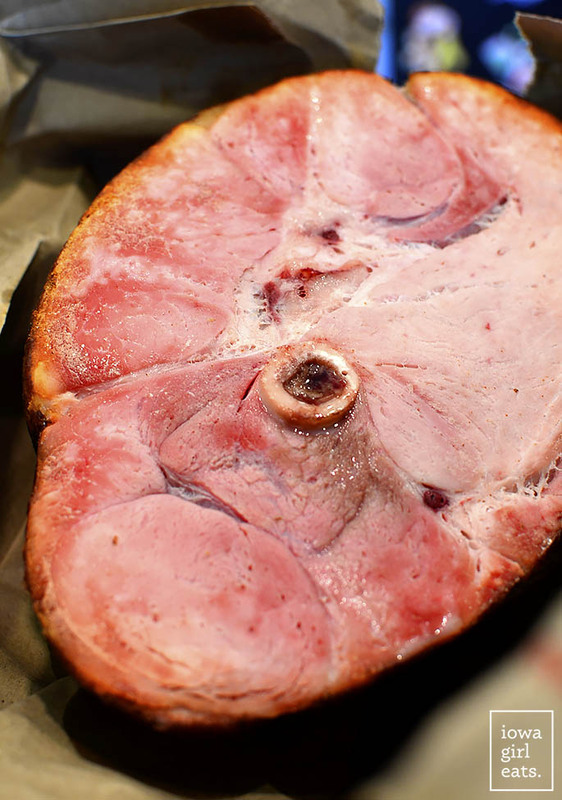 My Mom, and her Mom before her, has been making our Christmas and Easter hams using this method for decades and it yields the most delicious and juicy ham you’ll ever slice into. Plus, like I said, it’s a no-brainer. Bag, ham, bake. 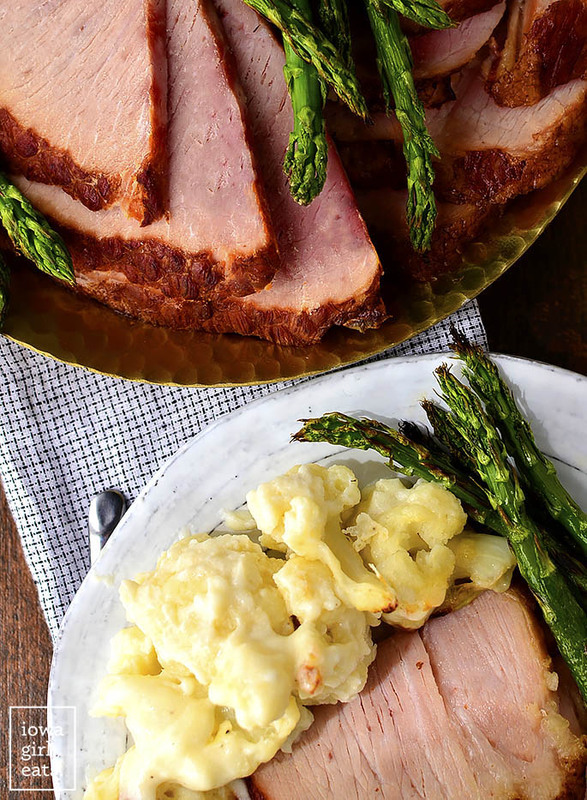 No glazing, no broiling, no brushing – just ham in all its juicy, porky glory. Amen. I recognize that cooking a big hunk of meat can be intimidating, and I was in the same boat until my Mom taught me her paper bag baking ways several years ago. If you’re hesitant too, baking a fully-cooked smoked ham is a great way to dive into the world of big meaty meats because all you’re doing is warming it up. You get all the glory of pulling a piping hot ham out of the oven, but none of the pressure that comes along with making sure an entire turkey is cooked through, for instance! Now, I just have to put this out there – as soon as Ben found out I was baking a ham in a paper bag he said “you know that’s incredibly dangerous, don’t you?” Buzzkill! And honestly? I didn’t! Call me crazy (go ahead, I’ll wait) but the thought truly never occurred to me because brown bag baked ham is just what my family does. Stepping back, SURE I recognize the fact that putting paper into a hot oven could be risky, but my Mom’s been baking our hams using this method as long as I’ve been alive without incident. Plus the bag doesn’t come anywhere near the sides, bottom, or top of the oven. That said, if you don’t feel comfortable baking a ham in your oven then of course, don’t! As for the rest of you? LET’S DO THIS. Start with a bone-in smoked ham. 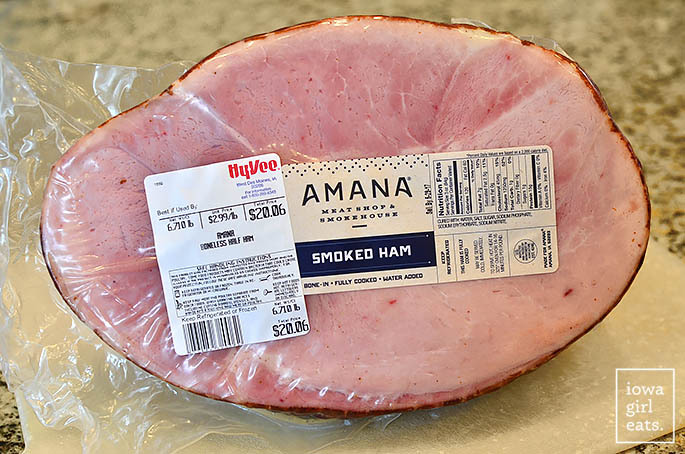 My family has always used Amana hams, made in Amana, IA, and boy are they delicious! Plan on 1/2lb ham per person which sounds like a lot, but that’s figuring in the weight of the bone plus any fat that will be trimmed away. 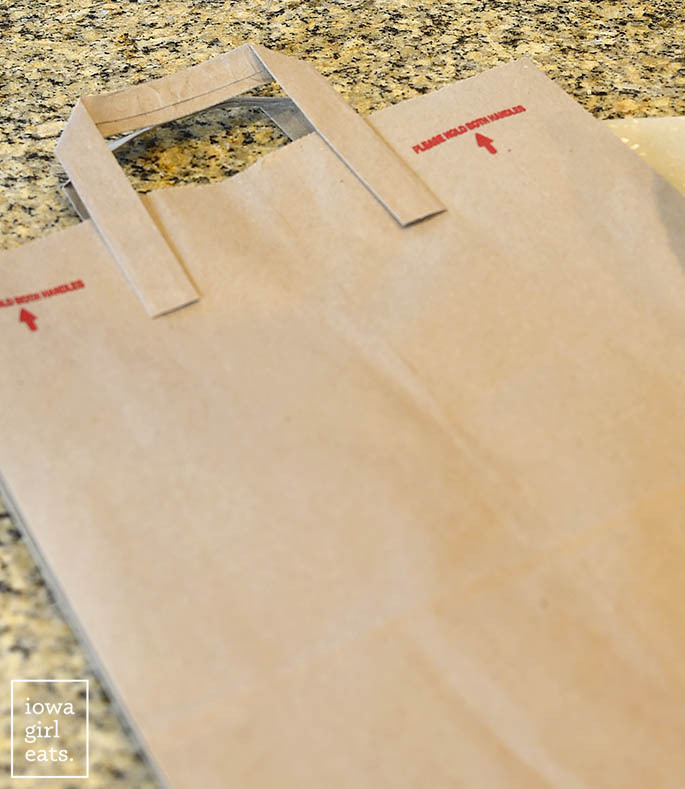 Next, cut the handles off a brown paper grocery bag. Then, wait for it…. Put the ham in the bag. Told you it was easy! ? Fold the top of the bag down then place on a cooling rack set atop a 9×13″ baking pan and press the bag down around the ham. Move the oven racks to the very top and very bottom of the oven then place the ham inside and bake for 18 minutes per pound at 325 degrees. So, for example, you’d bake a 2lb ham for 36 minutes. Be sure the bag isn’t touching the racks, back, or oven door. As soon as you press the ham, the juices start flowing. Truly, the brown bag baking method makes The. Best. Ham. You’ve GOT to try it! 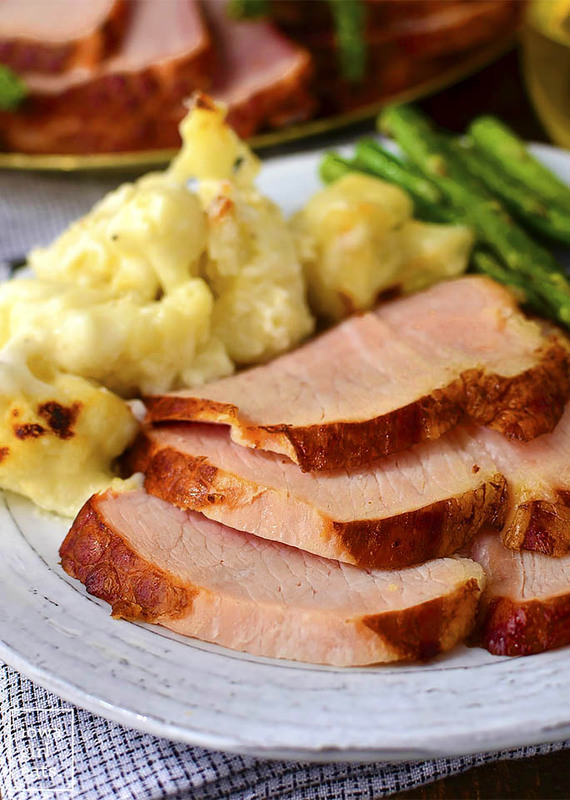 Last thing – we always buy a ham that’s a couple pounds over the amount we’d eat at Easter dinner because the leftovers are so versatile. Saute chopped ham and spinach then top with a fried egg. Pair with swiss cheese to make a decadent hot ham and cheese sandwich, or enjoy it between two slices of bread straight out of the fridge with plenty of mayo and mustard. 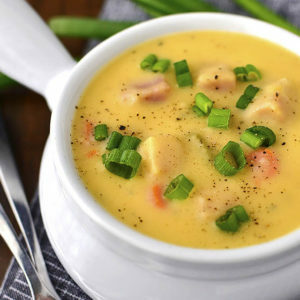 Of COURSE, you’ve got to make a batch of this soup, too. What can I say, Brown Bag Baked Ham is the gift that’s keeps on giving! From our family to yours – enjoy! 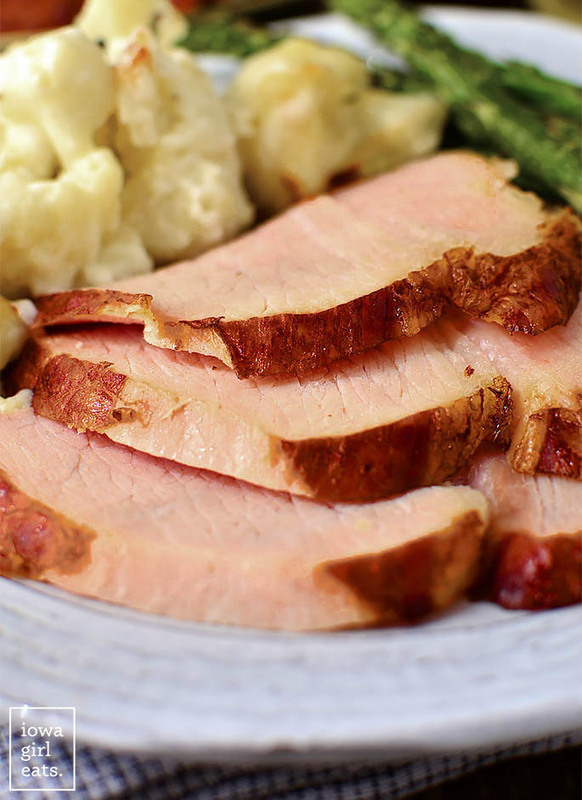 Brown Bag Baked Ham produces an unbelievably juicy and tender ham that's holiday-table ready! Place oven racks in the lowest and highest positions then preheat oven to 325 degrees. Place a cooling rack on top of a 9x13" baking dish then set aside. Cut the handles off a paper grocery bag then place the ham inside. 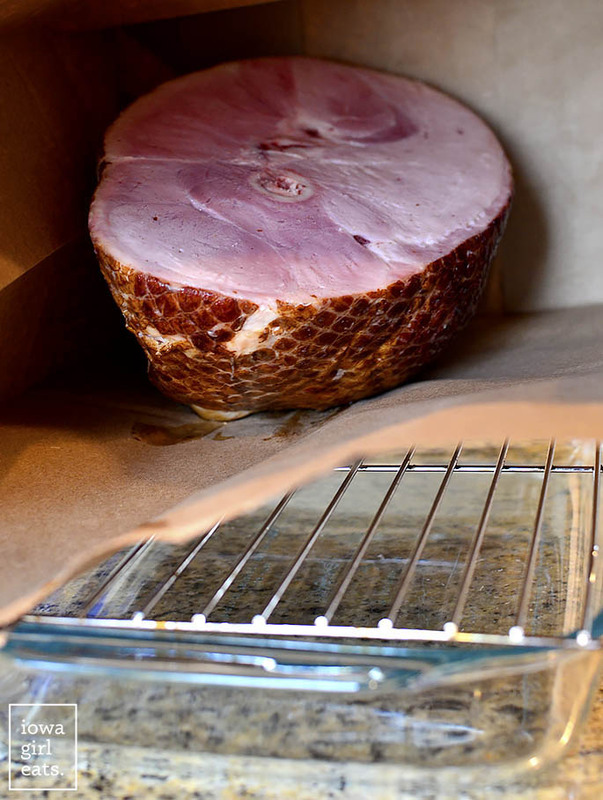 Roll the opening of the bag down then press the bag around the ham and place on top of the cooling rack. Bake for 18 minutes per pound (so for a 2lb ham bake for 36 minutes,) then remove ham from bag, slice and serve. 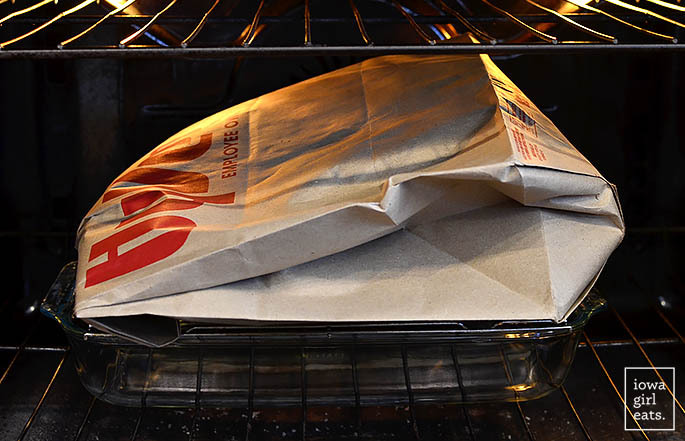 Be sure the paper bag is not touching the sides of the oven, back of the oven, or baking racks. I’m not always a big ham person, but this looks SO delicious! It looks so simple too, thanks for the recipe! This looks great! Who KNEW you could bake a ham in a brown bag?!? Will you be sharing the recipe for the cauliflower gratin? Has that been on the blog in the past and I missed it? 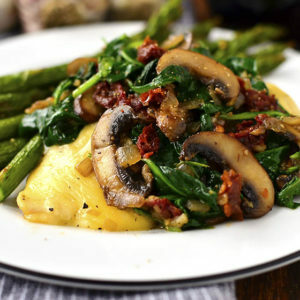 It looks so delicious and would be a great substitute for cheesy potatoes! This brings me back to Christmas!! I LOVE baked ham. I was always more of a ham fan than turkey! Same! Turkey is so meh in flavor compared to a nice salty ham! Amana hams are SO GOOD! Another reason to be glad we live in Iowa! Gonna try this recipe Sunday; thanks! 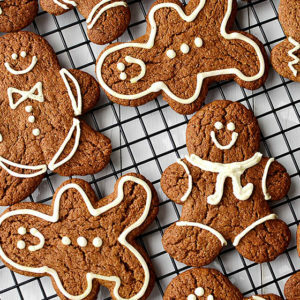 Agreed – I look forward to eating them every year! I hope you love using this method, Karla! WHAT!? I definitely thought this may be an April Fool’s joke. As a firemens daughter, I cannot imagine putting paper in the oven! How does that not cause a fire?! The paper doesn’t touch any heat source, and paper doesn’t ignite until it reaches 480 degrees. I know it sounds crazy if you’ve never done it, but like I said my Mom’s never had an issue! I am going have to try this. Have done it with a chicken and a turkey but never thought abut doing it with a ham. Is the cooking method and time the same for a non-smoked ham? Love ham and love the leftover even more! I don’t think we’ve ever tried cooking a non pre-cooked ham in a bag – I’ll ask my Mom though! Wow, this sounds great! The ham looks way more moist than mine turn out smothered in foil. Gonna try it out for sure. Thanks! So, so moist – I hope you love it, Mary! I would really like to try this, but looking at other sites on the internet, I have found that they say to use a bag with no printing on it. What are your thoughts on this? I notice your bag is from Hy Vee, so you obviously have printing on yours. I have searched online for bags with no printing, but it is not an option as I don’t want to purchase 50 bags. 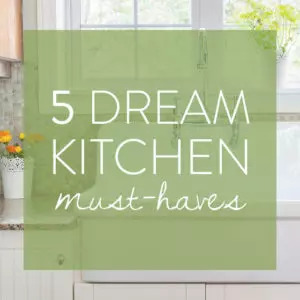 Please comment and thanks for all of the great recipes. I asked my Mom about this too and she said she’s always used printed bags. I am going to try it in the bag from the grocery store. If your mother, & you have done it for all these years, I am sure it will be fine, printing and all. Looks amazing, and we are looking forward to Easter Ham cooked in a brown grocery bag! Made this today so so juicy!!! Impressed myself thanks so much Iowagirleats!! Our Easter brown bag ham turned out perfectly juicy and tender. Our guests were a little freaked out when they saw the bag, but like others said, I just told them your mom had been doing it this way for decades. Who’da thunk it? I now have a new way to cook holiday ham. Thanks, Kristin and Kristin’s mom!! HA! Looks like you got the last laugh – love it! I don’t usually comment in post so good or bad. However, I have to comment on this one. I hosted my family Easter for only the second time. I debated from several recipes; this one or ones where you constantly baste the and like my mom has always done. I have made lots of Iowa girl eats recipes and never been disappointed. Therefore I decided to try this one. Once again I was not disappointed! I will be cooking my ham this way from now on!! Thank you so much for the great feedback, Andrea! I’m so glad you all loved it!! Hi Sandy! I’ve never tried adding a glaze using the brown bag method so I can’t say for sure. Can you do this method in a roaster oven or just a conventional oven? I’ve never tried a ham, but my mom has a paper-bag apple pie recipe that is our go to for Thanksgiving. I’ll have to try the ham! I am somewhat hesitant to put a brown paper bag in the oven. Has anyone tried to make a bag from parchment paper, which is made to go in the oven? I am 44 and my mom has been doing this all my life . The only way to bake a ham !!!!!!! Thanks! My mom always did this, too, but I could never remember how long she baked the “already cooked” ham. Just remember we went to church and came home to a house that smelled like wonderful Easter HAM! My turn to fix dinner this year and the bagged ham will be the centerpiece. My sides will be different, spinach salad with mandarin oranges and red onion slivers, Brussels sprouts lardon, roast lamb with a red wine and cherry reduction, roasted baby potatoes with fresh herbs and cheesecake. Mom always made the cheesy potatoes and “the green bean casserole.” Happy Easter! Sounds like a FEAST, Marjorie! Home this recipe tastes just as good as you remember! My mom always cooked her ham this way. She would wet the bag. I think it was just a precaution so it didn’t burn. I agree it is the best tasting ham ever. Usually there is no juice that leaks out, however if any does it’s caught by the baking dish the ham sits on top of.